Happy Wednesday everybody! And happy start to a new novena! St. Jane Frances is a patron for women, especially widows (the religious community she founded accepted women who were rejected by other orders due to their age), and mothers. She is also the patron of in-law problems (! ), and those who have lost their parents. O Glorious Saint, Blessed Jane Frances, who by thy fervent prayer, attention to the divine Presence, and purity of intention in thy actions, didst attain on earth an intimate union withGod, be now our advocate , our mother, our guide in the path of virtue and perfection. Plead our cause near Jesus, Mary and Joseph, to whom thou wast so tenderly devoted, and whose holy virtues thou didst so closely imitate. Obtain for us, O amiable and compassionate saint the virtues thou seest most necessary for us; an ardent love of Jesus in the Most Holy Sacrament, a tender and filial confidence in His blessed Mother, and like thee, a constant remembrance of His sacred passion and death. Obtain also, we pray thee, that our particular intention in this novena may be fulfilled. V. St. Jane Frances, pray for us. 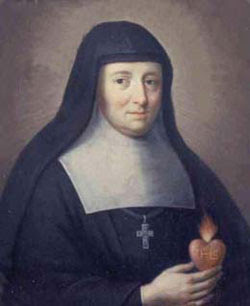 Almighty and merciful God, who didst grant blessed Saint Jane Frances, so inflamed with the love of Thee, a wonderful degree of fortitude through all the paths of life, and wast pleased through her to adorn Thy Church with a new Religious order; grant, by her merits and prayers, that we, who sensible of our weakness confide in Thy strength, may overcome all adversities with the help of Thy heavenly grace, through Jesus Christ our Lord. Amen. O great Saint Jane Frances! who, to follow the inspirations of the Holy Spirit, when thou wert called to the religious state, didst despise all the ties of nature and of blood; obtain for us also the grace to correspond faithfully with all divine impulses, and to sacrifice to God whatever is most dear and precious to us. Amen. Are you praying the novena along with us this month? Write in and let me know! Woo hoo! Just finished praying for my partner, here's to big things happening through the course of this novena. St. Jane Frances de Chantal, pray for us!